In the latest smackdown of the big banks making the rounds, namely JP Morgan Chase Bank, Natl. Assn. v Butler, heroic Judge Arthur Schack puts Fannie Mae in her place more than any other judge I’m currently aware of. He takes Fannie to task over a portion of Fannie’s Servicing Guide (Part VIII, Chapter 1, Section 102) that I have always found shockingly arrogant and at odds with the law. Schack correctly concludes that “FANNIE MAE’s Servicing Guide, with its deceptive practices to fool courts, does not supercede New York law.” I had the same thought when I first encountered this fiat decree of Fannie Mae’s when researching my own lawsuit against Fannie Mae and others a couple of years ago. It is a relief to hear a judge articulate this so starkly. However, I am somewhat dismayed to read that Schack refers to Fannie Mae as the “owner” of the note and mortgage throughout his decision. Schack appears to be relying on affidavits from Fannie Mae/Chase types for this information, as he must. I haven’t read the affidavits on which Schack relied, but I have read information from Fannie Mae’s own trust documentation and website that puts the lie to the idea that Fannie Mae owns anything. Fannie’s Duplicity–All Things To All People? Notice the duplicity of Fannie Mae made plain in these documents. In the Fannie Servicing Guide, Fannie’s intended audience is obviously its servicers, so they want the servicers to believe that Fannie Mae is “at all times” both the owner and holder of promissory notes. 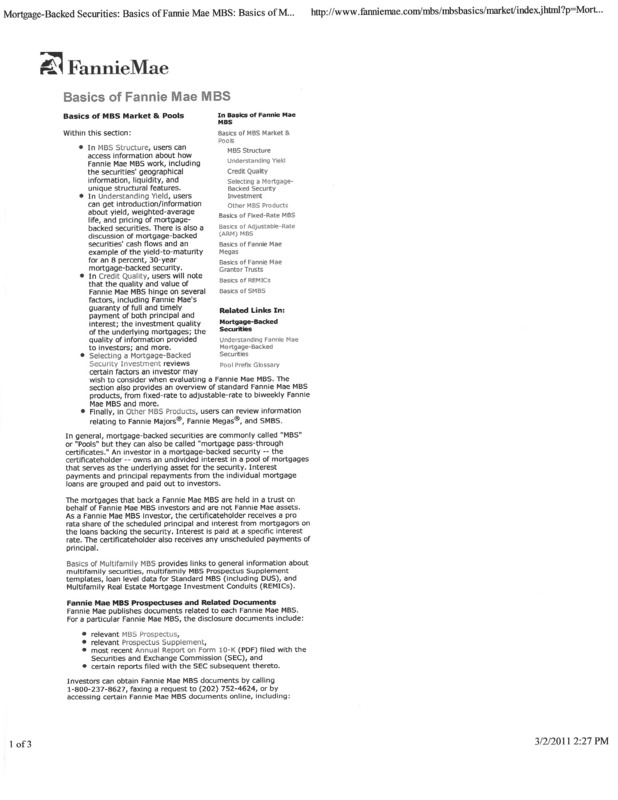 However, in the other two documents (the “Basics of Fannie Mae MBS” website excerpt and the Amended 2007 Trust Agreement) excerpted above, Fannie’s intended audience is investors and potential investors, both of whom Fannie wants to believe that they (the investors or potential investors)–and not Fannie–are the owners of the promissory notes. So why is anyone letting Fannie Mae get away with saying that it owns promissory notes (and by extension the deeds of trust/mortgages) and can foreclose due to that ownership? Please spread this info far and wide. This entry was posted in Fannie Mae, Foreclosure and tagged Arthur Schack, asset, Butler, Chase, Fannie Mae, foreclosure, foreclosure fraud, Investopedia, MBS, servicing guide, trust, trust agreement, trustee. Bookmark the permalink. I can’t find this specific statement in the document mentioned and I believe it is very important to have the right Fannie Mae document to throw in their faces in open court. Can you point me in the right direction? Which doc is this exactly or where did you see it on Fannie’s web site? You are correct, that statement is not found in the document I linked to. Interestingly enough, the statement WAS there when I linked to the document back in July. Fannie had already scrubbed the statement off its publicly available website where I found it a couple of years ago. I believe I saved the document as a jpg (screenshot). Let me look for it and I will get it to you ASAP. Please send it to all of us. Thanks Shelley! I am finding deleted documents constantly also. The banks are busy trying to cover up their fraud. Found it. I will email it to you and you can blast it out on your email list! But hold on, isn’t Fannie Mae still in receivership with the FDIC? So how can Fannie own *anything*??? Even though Fannie is still under the conservatorship of the FHFA, they are still considered by the government to be a private company. That’s what I was told when I FOIA’ed Fannie in ’09 or ’10. So because they’re supposedly still private (despite the bailout and conservatorship), they aren’t subject to FOIA. Pretty convenient. Of course it’s complete BS, but that’s what they told me. It appears the banksters and the government know who to game play the system and do it wel, being pro con artist. Point is they never did own anything period! It has been my belief all along the receivership was to conceal the fraud. Shelley, I have been thinking exactly the same thing, and it ties into why homeowners consistently lose court cases when they shouldn’t. Working on a post about that soon. Yes Freddie and Fannie and the Three Stooges of MERS were all part of a con game using shell companies to conceal defraud and confuse. Have you listened to attorney Pratt stating MERS was formed in the days of the S&L crime waive to skirt around unmovable loans, and boast how MERS moved over a million unmovable loans. That should have put the WA Supreme court justices on their ears. Wake Up Call Judges! Pratt just boasted MERS moved over a million unmovable loans, and was not to save filing fees, but to skirt around unmovable loans. It did both and made the banksters happy. Look up video Bains V MERS oral argument, Melissa Huelsman and you can watch this man admit to a crime and no one blinks an eye. My mouth dropped to the floor. Sure looks like one could ask for judicial notice of the case in this document and demand a return of all stolen property and a stop to the harm and damages of paying for frivolous litigation in order to save our homes from thieves. When the courts judges rules commitee and all AG’s know there are no notes. Then begin cases against all the bankster lawyers and judges for violation of 18USC4 and knowingly harrassment and frivolous law suits with lack of standing. Fraud UPON the Court. The AG’s allowing it all. Okay, so if Fannie is the plaintiff, is that possible? In my book NO! No more than any of the other frauds. Need to follow the money trail. Since most of the government is ran by lawyers perhaps the AG’s are in violation of 18USC4. It includes all officers of the court. And the assignment trail. I am wondering if we should all send mass letters to our state DOJ and the local police departments and the County Sherriff, with the transcript attached [make it simple for them] and request prosecution of the banks and their lawyers firms and the foreclosing companies and the judges that are breaching their oath of office and violating 18USC4. Among other violations. We have a valid complaint. I agree, Shelley–we DO have a valid complaint. Which is why they’ll ignore it and pretend not to know what we’re talking about! When the FHFA appointed itself conservator of Fannie and Freddie all rights, titles powers and privileges of Fannie and Freddie immediately and by operation of law succeeded to the FHFA. see 12 U.S.C. 4617(b)(2)(A)(i)(ii). The FHFA conservator is the only entity with legal standing to “collect any obligation and money due the regulated entity” 12 U.S.C. 4617(b)(2)(B)(ii); see also Federal Housing Finance Agency v. UBS Americas (2nd Cir. 2013). The US Congress, by passage of the Housing and Economic Recovery Act 2008 (“HERA”) created a ‘field of preemption” and a ‘conflict preemption’ relating to anything involving Fannie and Freddie (see Federal Housing Finance Agency v. City of Chicago (N.D. Ill 2013 – memorandum opinion) and Congress stripped all courts of jurisdiction to do anything that interferes with the stautory duties of the FHFA conservator. In other words if the FHFA conservator is not present and participating in a foreclosure action — the courts have no jurisdiction. See 12 U.S.C. 4617(f). Can you file a motion to dismiss a fannie mae complaint due to not being the holder of note and mtg? I am not an attorney and cannot and do not give legal advice. If I were you, I would consult a licensed attorney on these matters and/or legal self-help websites and books. do you have the original link, from the fannie mae website, for the document from fannie dated feb 6, 2012. would love to have it. cant find it on the web. Please send me the document stateing that Fannie mae does not own Notes and whatever else you can. Im fighting them tooth and nail and could use some help. I dont know how to find your Emails to email you so please send to Godsfreedomchurch@gmail.com or call 509-879-2306 and leave a message if no answer. You guys are the best. THANKS A BUNCH, This is an old blog so hopefully I get a response. Fannie Mae is own by a pool of investors……. And fannie Mae is the trustee for all the investor ….but I heard a saying. …Rothschild finance one of his own company……..also Fannie Mae is a public company… Offering shares too the public …why don’t u check and see who buying the public shares…..cause it look like ..Fannie Mae is a trustee for a group of public members….the public own this company. It says Fannie Mae is a government sponsored incorp ….so who owns it .who own that company and why is the government helping this company out ??. I believe the Illuminati own this company too . Wait on min… Wait a min…Fannie Mae got a loan from the government ..50 billion loan..probly total out too 150 billion back…..n…Fannie Mae could have a refinance too a nother bank or investor ….which fannie Mae may be in well over 600 billion in debt ….but pay close attention too this message ..Fannie Mae will be active ….too ya mortgage .onless they stop paying the parties they owe ..then….who ever got loan ..want own they loans then…those parties ..can…file for a default contact on Fannie Mae and then take the company from them……then….ya money a start going too the new owner of Fannie Mae…but if u don’t pay ya mortgage .u will get forcloser. So pay ya bill..n…if u are in trouble on ya loan…seek out a modification ..or refinance .if u have already did all of this. .then ….u will have too pray too god for u some help ..cause .they will go for foreclosure if they already have help u and u still behind..